The Wisconsin Court of Appeals today issued their decision in Becker v. Becker, which is not published, but as a signed opinion, is citeable. The case does not create any new law. Essentially, it restates prior law that intent is not a prerequisite finding to prove shirking. 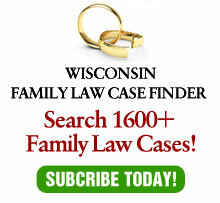 Years ago, I wrote an article “Without Intent: Developments in Defining Shirking”, Wisconsin Journal of Family Law, Vol. 13, No. 4, October, 1993, in which I opined that intent was no longer a necessary element to prove shirking. Rather, it is simply a factor. The test, instead, was whether the choice of employment is reasonable in light of the support obligation. The court in Becker has it right. The husband is a cardiologist who professes to have no income. He argues that the trial court, which imputed income to him for support purposes, did not find that his choice to run his own clinic was intentional for the purpose of avoiding support. The court held, consistent with prior cases, that proving intent was not necessary. A vocational professional testified that his income capacity was $300,000 to $400,000 per year. Earning zero seems, at best, suspicious, but certainly makes the choice of employment unreasonable where there is a support obligation. In a non-divorce scenario, employment choices are frequently made for non-economic reasons. Some women (and more and more commonly, some men) forgo substantial income because they prefer to stay home to raise their children. Some employees do not like a boss, their co-workers or a myriad of other things about work and change jobs for less paying, but more enjoyable circumstances. If there is no support obligation, that is their choice. But, if there is a support obligation, the choice of employment must take it into account. The “intent” test is too difficult – a court cannot read someone’s mind. A court can, however, ascertain what it thinks is reasonable under the circumstances. Much to Dr. Becker’s dismay, but not surprisingly, a cardiologist with no income does not seem reasonable in the least.